UPDATE 10/04/2017 - New 6ft ring kiln installed and ready to start producing very soon, watch this space! I don't make huge quantities of charcoal, when I do it is usually during spring into summer using up coppiced wood so I don't often cater for very large orders, but if you are after a few bags for you BBQ and especially if you are local to the Portsmouth area, it's definitely worth dropping me a message to see if I have any in stock which I can perhaps deliver. 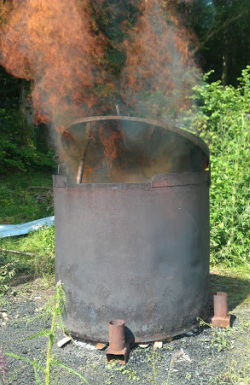 It's definitely a good, local, sustainable way of fuelling your BBQ or pizza ovens! I sell my 3kg bags at £7.50 each (2017-18 price), It usually goes pretty quickly after each burn, so if you want a few bags it's best to put in an order early on in Spring. I don't usually do individual orders over 10 bags. The Kiln is stacked as tightly as possible with seasoned wood. In this case a mix of hazel, maple and goat willow. 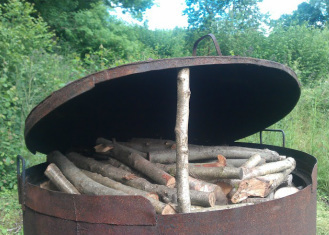 The base of the kiln is prepared with kindling set in a channel so as it can be lit from the base on the outside and the newly set fire draws into the centre of the kiln. The kiln at this stage is beginning to calm down and goes through another stage of smoldering burning before the white smoke clears to blue smoke and finally very little smoke. The shot here is with no chimneys present and the base is still able to draw through air. 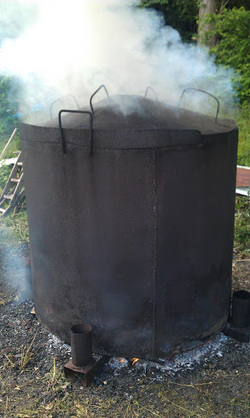 Finally the Kiln is opened and the charcoal sieved to grade it accordingly from chunky lumpwood through to 'fines'. Should any large pieces not be entirely charcoaled, (pieces known as brown ends) they are put to one side to be returned to the kiln next burn. Once the fire is set and the wood is burning, the smoke builds, starting off thick and white as the moisture in the wood is driven off and the combustion gets under way. A little later the wood gases begin to burn and the kiln starts to roar. In this case the lid was left open and the supporting stick burns through rapidly when the flames really get going thus closing the lid. 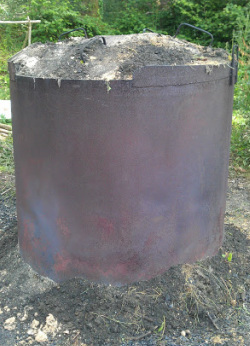 You can also see the feet, to which the chimneys can be attached to regulate the burn properly. The final stage. The kiln is closed off so as to inhibit oxygen and thus inhibit combustion. 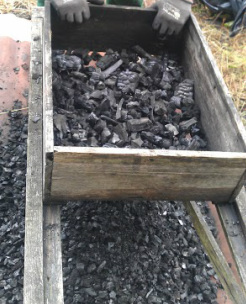 The remaining wood is effectively 'baked' in an oxygen free environment which results in charred coals - charcoal. As shown the base is steeped with sand as well as the lid to provide a good seal. The kiln is then left to cool. Hampshire Lumpwood Charcoal ready for sale! Once graded, the charcoal is bagged up in 3Kg bags, ready for your BBQ.